There’s no turning back: we’ve officially shifted from the sleepy newborn stage into a whole other beast. It was good while it lasted, I have to say. Arlo’s development is steaming ahead, and with that has come his first sleep regression (or “progression”, if we’re seeing the glass half full), and his desire to never miss a cool thing in his new world. Things have gotten really stinkin’ cute, a bit ugly (mainly, the circles under my eyes), and kinda scary. He basically turned into the wide-eyed “deer in headlights” emoji overnight. Actually, I think someone should make a new emoji just for babies going through sleep regressions; how about a wide-eyed baby who is simultaneously laughing and crying? With devil horns too, of course…but I digress. We’ve been through countless sleep setbacks before, with big sis, but for some reason I thought we might cruise past them this time. We’ve paid our dues! I protest to the Sleep Gods. LMAO, say the Sleep Gods. It’s okay, though—we will survive. On the bright side, this crazy time has given me the nudge to start something I’ve wanted to do for a while now: shorter, more easygoing blog posts. I’ve been thinking about this for a long time (and even tried it out a while back if you recall, but eventually my inner Chatty Cathy got the best of me…oops). I’m trying it today and popping in with a quick recipe and a few photos. I just added this smoothie bowl to the app a week ago, and it’s my current obsession. I devour a bowl every single morning lately (and chase it with a coffee or matcha to warm up…the best.). A few things to note. The recipe calls for dates, but I don’t tend to use them because I don’t mind a smoothie that’s just mildly sweet. However, my lovely tester, Nicole, thinks it’s a bit bland without the dates added in, so I’ll leave it up to you whether to include them or not. (Granted, it does taste ah-mazing with the dates.) You can always taste the smoothie before adding them in and then make the call to suit your own taste buds. Also, a word to the wise: Some blenders have a hard time blending hemp hearts and dates smooth enough, so I recommend using a high-speed blender for the best results. Lastly, I always use a stevia-free protein powder as I don’t like the taste of stevia (and find it can overpower some smoothie flavours), but whatever you use, just know that the protein powder will greatly impact the overall flavour. I use Sunwarrior Warrior Blend in Natural in this particular recipe. Some people love it and some don’t; use what you love and you can’t go wrong! Well, I just clocked in at 500 words for what was supposed to be a quickie blog post. Chatty Cathy strikes again. (Eric just said, “Must be the Maritimer in you.”) Maybe this is going to be harder than I thought. I just can't get enough of this creamy, monochrome smoothie bowl! Packed with protein and healthy fats, it keeps me going all morning long, and its subtle, earthy flavours and thick texture are the perfect base for loading on all kinds of toppings. Add 1 cup (250 mL) of almond milk into a high-speed blender, followed by the rest of the ingredients. Blend until smooth. If necessary, add more milk to get the blender going. Pour into a bowl, and add your desired toppings. Serve immediately and enjoy with a spoon! * Be sure to use a large frozen banana or the texture of the smoothie bowl won't be thick enough. ** If you are omitting the protein powder, you can reduce the almond milk to 1 cup (250 mL), and add more from there if needed. I use Sunwarrior Warrior Blend protein powder in "Natural". It's important to use a neutral-flavoured protein powder so it doesn't overwhelm the delicate flavours of the smoothie bowl. If you want a bit of a kick flavour-wise, try adding some fresh ginger (to taste) to heighten the flavours. 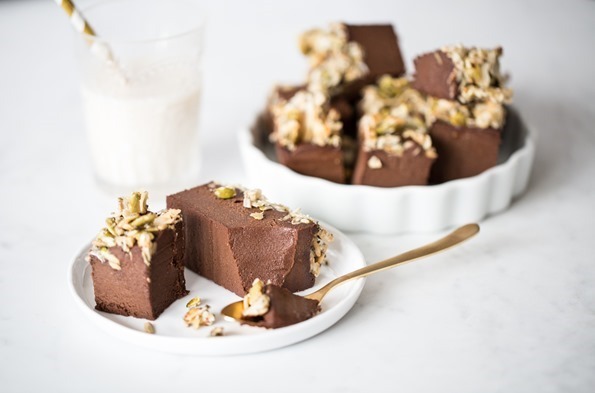 Also, just a heads up that I’ll be sharing this new recipe for nut-free freezer fudge in the next issue of In the Glow! Be sure you are signed up (and don’t forget to confirm your subscription). It’ll be going out before Valentine’s Day. I wish this was my breakfast/lunch today! This looks so delicious! I love thick smoothies like this! Hmm looks so tasty! I think it fills you up like crazy. You’re ready for the day now. love the flavours in this beautiful monochrome bowl! I can tell this would stick to your ribs and keep you full foreva! Thanks for sharing your awesome tales of motherhood :) Hope you get some Z’s soon. I saw this recipe this morning and made it for lunch! I love how thick and creamy it is. The flavors are nice and subtle. Loved it! Also – I would love to hear about balancing two babies. Its in my near future. We have had this twice now- kids love it too! I only had flavored protein powder- both vanilla and chocolate worked for us! I love the idea of smoothie bowls, but haven’t gotten around to trying one. This one looks amazing! Could I skip the bowl and turn it into a morning smoothie? P.S. I love your recipes and books! Keep up the awesome work. Good luck with the little one. Hi Patricia, You could absolutely turn this into a smoothie! If you want it less thick, try adding a bit more almond milk/milk of choice. And thank you so much for your kind words! Looks delicious! I’ll have to make it in the next couple of days when our temps are set to be unseasonably high. I’ll try adding ginger like you mentioned. Props to you for finding a way to name and market that smoothie color! This will be a nice change from the fruit or green ones we’ve been loving lately. I’d love to read more casual posts, but I love all your posts! I struggle with the short posts, too! Especially since I don’t post frequently. One tip I try to keep in mind is to write about one topic per post only. Pretty sure I have been failing at that lately though! Thanks for both the advice and the sleep wishes, Jill! I loooove all of your posts…short…long…chatty…. although I don’t think you are chatty they are Always real and perfect! I will try this smoothie this week. We have your hidden greens chocolate smoothie every single morning for breakfast! It is the best! I make up smoothie bags every Sunday and pop them in the freezer to then blend up into vitamix every morning! We are up super early so its great to have everything pre-measured and then we just have to add almond milk and blend! If not an easy smoothie I will make your carrot cake oatmeal, or overnight oats with lots of good stuff mic=zed in! I will cook up a batch for us to eat and have a variety of toppings and fresh fruit! I also have a freezer stocked with your soups and stews for lunches. I would love if you could post a quick “what we ate this week list” at the end of your post, so we could have a snapshot meal plan. I own all of your cookbooks and looooooove the app! Thank you sooo much for your expertise! I sure hope Arlo gets settled into a new routine soon, so you can get some well deserved sleep! We wish you the very Best! I hope this smoothie bowl powers you through the rough sleeping time! It looks absolutely delicious…but I am also addicted to smoothies! Just made my first smoothie bowl! This recipe is perfect! Thank you ? Delicious! I just made this (without dates, because I’m trying to cut down on sugar intake, and without protein powder, because I don’t have any on hand), and it is SO good! Thank you for another great recipe!! I hope Arlo gets in a good groove soon! I remember sleep regression at 4 months with my first girl–she got in a good routine pretty quickly afterwards though. I’ve been reading your posts with greater interest this year because you had Arlo a few months before I had my second baby girl (had her Jan 8th). She has acid reflux so is a terrible sleeper–she can’t even sleep flat yet and she’s now a month old, so I feel you on being sleep deprived! It’s crazy how every baby is so different! By the way, I make a very similar smoothie to this every morning and I gulp it down–so good! I forgot how starving you are the first few months after having a newborn! This would be perfect for breakfast or lunch! Looks delicious! This was so delicious! If your like me and dont have unflavored protein powder I used Vega Sport Performance in Vanilla and just omitted the vanilla extract and 1 date. Tastes like heaven, thank you! Love it, will have to make it this week! Thanks for sharing!!! Question re. the optional scoop of unflavored protein powder. Could this be substituted by hemp hearts? Currently have no unflavored at home but like to add that kinda substance and extra protein. Hi Rachel, You can definitely add more hemp hearts if you’d like. Just keep in mind they add a grassy flavour so the smoothie might not taste quite as sweet. I just wanted to tell you how much I love your site and app. Your pictures are gorgeous, your recipes are amazing and your writing is so warm and welcoming. I smile every single time I see a new post in my inbox and I check the app regularly. It is by far my favorite app, by the way!! Thank you for sharing your amazing recipes and you loving, positive personality with all of us readers. And good luck with the sleep!! ? Made this smoothie bowl this morning. It was delicious! My 4 year old son also devoured it. It was so filling and smooth. Will definitely make it again. I’m very much hoping you get a few good nights of sleep this week and next! Just a reminder: sleep is very irregular the first few months. We like to think sleep gradually increases on a gentle curve, but I think it’s more a jagged trend line. I finally learned this on baby #3. Just made this smoothie for breakfast, and I absolutely love it!!! It’s my favourite one so far. On a side note, thanks so much Angela for all you do!!! I’ve been following you for five years now, when I became plant-based. Your photography is so beautiful and your recipes are always a great hit with my family. I cook from your books and app every day, often twice a day. 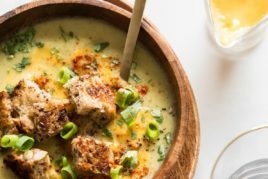 My husband (a die-hard meat-and-potato kinda guy) just recently decided to make healthier choices and your recipes have been a tremendous help with his transition. Hang in there with the sleep deprivation! I can relate, it was for me the hardest part of motherhood but nonetheless I wish I could go back to those precious times when they were newborns. Now all three are teenagers, whew when did that happen?! OMG!! I am the one who usually skips smoothie bowls, just never sounded good. But this one, amazing!! I love it. I put some homemade nutty granola on top. Dessert for breakfast! YUM. Love your posts. Just picked up my new cookbook of yours, yippie! So loved my first I knew I needed your next one. One question if I can…… I cannot eat bananas…. (GI issues), alternatives are so unsatisfactory. I use applesauce and not sure what else I can substitute…. your thoughts? The bowls just look so good, and I love the texture and crunch of these. Thanks and hopefully the sleeping will get bettter. ( our DIL is dealing with similar isssue, 6 months old and doing well in all areas but sleep). Thanks for the warm words, Cindy! As to your banana sub question, you might be able to get away with adding more pitted dates (to compensate for the lost sweetness) and a touch more avocado (to mimic the creaminess). If you try anything out please let us know! Maybe you could try substituting some silken tofu in place of the banana and then increase the avocado and maple syrup as Angela suggested. I love how the chia seed flecks make the whole thing look like french vanilla ice cream. I subbed sesame seeds for the hemp hearts and it was awesome. Hi! 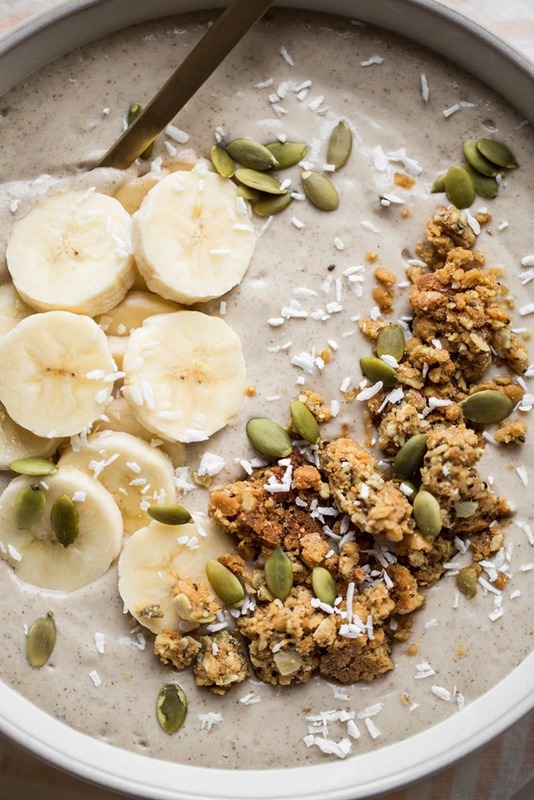 Love the looks of the smoothie bowl and will definitely try it. I had the dreaded stomach flu about a week ago and my tummy is still not feeling that great. Been having a hard time deciding what to have for breakfast. This looks like it would be really good! (Also saw the nut free freezer fudge – OMG!!!! Will be trying that as well. I’m so sorry to hear you’ve been sick, Charlene! I hope this smoothie bowl hits the spot. Feel better soon!! Veganism is such a healthy lifestyle choice. I’ve found these couple places in LA that offer really tasty and healthy vegan food…it’s a perfect option for when you don’t want to cook at home. That Smoothie bowl looks delicious! I will make it tonight for my husband and my little boy. I am sure it will be delicious as it looks like! And probably will make it again. Thanks for that recipe. Looks delicious! I am already signed up for your newsletter but I don’t think that I received the last one. I tried to sign up again, just in case, and it told me I was already signed up. How do I fix this? Wow, this was such a great addition to my smoothies list. I have got to say that I’m taking maca powder for my energies for the last 2 years, and I don’t like its taste at all. This smoothie was just great to mask the taste of maca. Thank you very much. Looks delicious! Definitely going to give this one a go. It will make the perfect breakfast. Loving all your recipes, keep up the great work! OMG great recipe. I never used a frozen banana before, it was kinda weird. I really like this as a ‘breakfast morning’ kind of bowl. Also, I signed up for the newsletter! So happy you enjoyed the smoothie bowl, Chris…banana and all! ;) I love adding them to my smoothies. And thanks for signing up for the newsletter; I hope you enjoy it. Hey Janina, We’re actually sleeping with Arlo in our bed (he’s in the middle though on his own little bed) and I do agree with you that it helps tremendously in terms of quick night feeding and getting back to sleep. I’m kind of dreading when he’s transitioned to his crib because I will inevitably be more awake with going to his nursery and nursing sitting up vs. lying down. ;) I’m trying to delay the transition though because I absolutely love having him in our room. So glad you’ve found something that works for your family! Angela, thank you for all you do to enhance our lives – love, love, love your books, blogs and social media. Your books are the only recipe books that I’ve made around 90% of the recipes, you know you normally pick one up, flick through a few pages, go that looks great then only make a fraction of the recipes – not with yours. Anyway I transgress. Wondering if you have any tips, thoughts, advice on a Vegan/Veggie diet for Teenagers? My 14 year old daughter has really adopted a healthy plant based diet in the most part and along with my husband then they only eat meat a few times a week, sometimes not at all. I’ve noticed recently that she is looking a little paler and seems a bit more tired. I know there are growth periods but wondered if you’d recommend which recipes are best for those young growing bodies? She’s not a big bean fan, favours more black beans than anything else and is not a big legume/tofu etc. eater. We try and vary dishes but I’m wondering if I’m missing some important part of the diet for her growing needs. Teenagers still love their snacks and carbs so shouting eat more tofu isn’t going to cut it!!!!! I’ve only been a Vegetarian for the last two years so I’m still learning about getting the right minerals/iron etc. so am no expert. Thanks so much and can’t wait to make the fudge this weekend – don’t think it will last for long!!! You’ve said that you are concerned about your daughter’s low energy, sleep and pallor. Have you considered visiting a dietitian or nutritionist? She or he can suggest bloodwork to test for any deficiencies and guide you in vegan nutrition for a growing girl. This might help you establish a “baseline” of where she is currently. Meanwhile, making decisions together is the best way to “feed a teen”. Flipping through your favourite cookbooks and apps and creating a meal plan with her input, ensuring several meals per week include her fave ingredients and accepting that junk food will be a part of her diet are key strategies. Since your daughter likes black beans, she might enjoy my Crowd Pleasing Texas Casserole and Summer Harvest Tortilla Soup from my Oh She Glows Cookbook, The Oh Em Gee Veggie burgers from Oh She Glows Everyday and Next Level Vegan Enchiladas from the Oh She Glows App. While you’re on the app, you’ll want to check out Cilantro-Lime Quinoa Salad and Lemon-Tahini dressing; both feature mineral rich tahini. For teen treats you can’t go wrong with Mile High Freezer Fudge and Peanut Butter Lovers Chocolate Tart and breakfast gets a “like” from teens when its my Magical Ice Cream Smoothie Bowl or Chocolate Dreams Protein Smoothie Bowl, all from Oh She Glows Everyday. 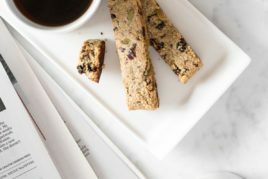 Fudgy Black Bean Brownies (in my app) or a big batch of glo-bars can be kept in the freezer for take-out :) And, what works for toddlers can work for teenagers…sneaking some hummus, tahini or pureed lentils into sauces and soups adds healthy hidden protein. So, sadly, I can’t have avocado (unless I want to be doubled over in pain for hours). Any recommendations to sub for avo? Hi Carrie, Oh no, that’s too bad! I would suggest adding a bit more frozen banana to make up for the lost creaminess. You might need an extra splash of milk to get it blending, depending on your blender. :) You could also try some solid coconut cream (the rich stuff at the top of a can of full-far coconut milk). I am definitely going to try this for my next meal! This sounds so good! My first ever homemade vegan smoothie and we fell in love with it! It tastes so yummy and healthy! Finally, the secret to the tasty fruit cocktail we stopped buying, because we don’t know what ingredients they put in it, is revealed. Thank you Angela! I am obsessed with making this as my weekend treat topped with bee pollen and coconut! 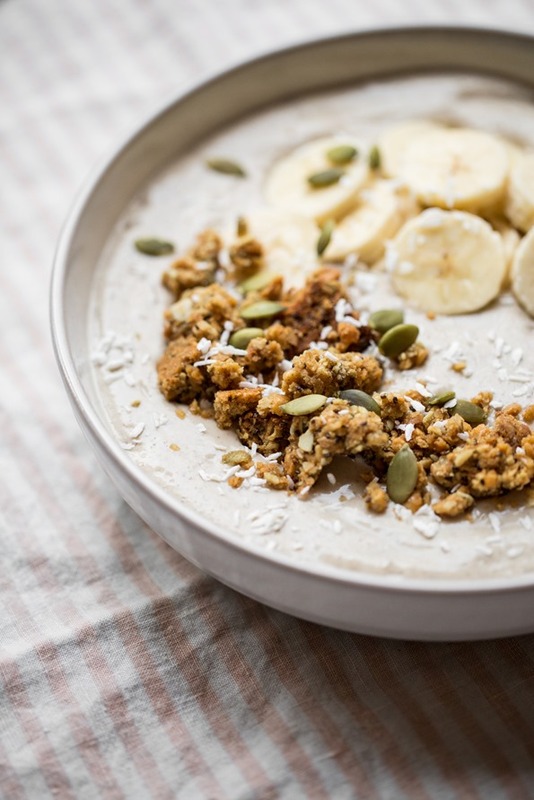 I’ve never heard of a smoothie bowl until this post! Where have I been! Will certainly be saving this recipe! Thank you ? i Jessica, Thank you for the kind words about my blog. :) To be honest, personally I don’t tend to use the dates because I enjoy a mildly sweet smoothie; the sweetness provided by the banana is enough for me! However, if you find it a bit bland without the dates, you could try a touch of maple syrup (I think it is low FODMAP). Maybe start with trying just 1 teaspoon, and go from there after taste-testing? If you try anything, please let us know how it goes. I’m eating this smoothie bowl right now and it is amazing!!! Perfect amount of all the right ingredients! I’ve made lots of smoothies, however this was my first ever smoothie bowl and it will now be on the weekly list! Just wondering about serving sizes. I know you don’t count calories but I find a lot of the recipes are quite large servings and because I have a chronic health condition affecting my mobility, I do gain weight easily. Just wondering if this is a serving for one? In general are your recipes steered towards those with high physical activity? Athletes? How do we get the serving portions right? I eat healthy food but do struggle with portion sizes and need to loose weight. Hi Claire, My recipes over the past two years have been geared toward fueling a busy, active lifestyle. In addition, I’ve been pregnant and/or nursing for the past 3 years, so the recipes–and perhaps portion sizes– tend to reflect that a bit too. ;) That said, you can totally adjust the serving size to fit your own needs. This smoothie bowl is meant to fuel an entire morning, but if that’s not what you’re looking for, it can be cut down. Like I mentioned in the post, I don’t make mine with the dates which is a great way to cut down on the sugar and make it a bit less sweet and also lower in calories. I think you can totally tweak most of my recipes to suit your own personal needs. Feel free to let me know if you have any specific questions on any of the recipes! Thanks so much for getting back to me Angela, I am currently trying an experiment of only eating your food. Prior to this my diet was all over the place, although healthy foods was always the focus, it was sometimes low carb, other meals were low fat etc. by concentrating on just high protein I’m hoping this will have some impact on my weight. I have one snack most days. Breakfast, lunch and dinner with a slice of one of your treats at the end of the day. At the moment I have the Two layer chocolate slice in the freezer…yum! Wow I cannot wait to try this. Can I use peanut butter instead of almond butter?? Or would it taste weird? Hey Emily, I don’t see why peanut butter wouldn’t work! Though you may find the peanut butter flavour comes through more than the almond butter flavour, which I find is a bit more subtle, would. If you try the swap out, please let us know how it goes! I just made this and it was amazing. Thank you! ! As I was skimming the post, all that sunk is was, “She’s a Maritimer!” I can’t help it, I’m from NB, with a fair bit of my life also spent in NS. I recently bought your book at Costco because the photos drew me in and, although I’m not strictly vegetarian, I am trying to find creative ways to eat more veggies and fewer carbs. I don’t buy many cookbooks, but one of the things that swayed me was that I read on the inside flap that you live in Toronto. I love buying Canadian made, so that decided it! Thanks for the great recipes, I’ve been loving the book and talking it up to my friends. Is this compliant to the whole 30 diet? Can you use Milkadamia Milk instead of almond milk for these recipes? I’m brand new to food allergies, and a friend sent me to this website. I am allergic to wheat (not Celiac’s though.. just the wheat allergy), eggs, shrimp, crab, cottonseed, and artificial sweeteners. I’m also lactose intolerant. Again, just diagnosed over a week ago…. I feel like I’m living off of chicken breast and salads right now. Hey Lisa, I think you could use any kind of milk that you like (keeping in mind the flavour will change each time). Feel free to experiment. Thank you so much for picking up my books…I hope you love them! This incredible bowl has become my weekend tradition! I’ve never been a big fun of smoothies bowl for breakfast before until my daughter send me this recipe I couldn’t wait to try it. I’ve made it twice already the first one I topped it with “Oat and Kamut” and the second one with “Popped Clusters” both from Kashi. It’s delicious and very healthy. Thank you Angela! I’m at that point now where I think I’ve seen every smoothie bowl on the internet and then I come across this little gem. It looks super creamy like a tasty bowl on banana-ry goodness. So healthy and yum. I’m wondering if my pea protein powder would be too overpowering in this and if maybe hemp protein would be better. I know sun warrior protein has brown rice protein, and I think that might be even more neutral flavor, so maybe if I can get hold of some of that. It also has rice oligodextrin, which is really cool stuff. Hi Angela! I loved this smoothie bowl! I’ve eaten it 3 times this week. I love how it kept me going all morning!! I have twin 5 year old boys and we are always going. I finally tried this smoothie bowl recipe for breakfast and I am so in love! I have been eating avocado toast just about every morning for the last 2 years, and your recipes have always proven themselves to be so incredibly delicious so I decided to venture out beyond my avo toast comfort zone. I’ve been following along with your blog for the last 3 years and I can honestly say it has changed my life in so many amazing ways. 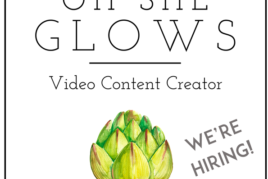 I have never made an Oh She Glows recipe that I didn’t love 100%. You are so talented and an inspiration to the entire vegan world! Thank you so much for all you do! 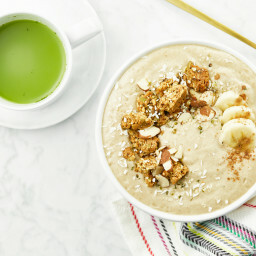 Question about this smoothie bowl recipe…..I ended up with a whole lot of leftover smoothie and am wondering what you think the best way to store it for tomorrow would be. Thank you in advance! Hi Heather, Oh, thank you so much for the kind words! I’m smiling from ear to ear. :) I’m not sure what this “leftover smoothie” is that you speak of though (haha). I haven’t tried storing any leftovers in the fridge, but you might be able to get away with storing it in an airtight container for a couple hours (possibly longer) in the fridge. The banana can tend to turn smoothies funky if they sit too long. Oh my goodness, this was so delicious! Had this for breakfast this morning not really knowing what to expect – and wow, it was amazing!! I didn’t have chia seeds or hemp seeds, so swapped them for ground flax and sunflower seeds. Topped it with some granola and flaked almonds. YUM. Thank you for all your amazing recipes and hard work in bringing them to us :) I recently bought your first cookbook and haven’t been disappointed by anything yet. Am now sorely temped by the second… Thank you again!! Let me just start off by saying, I am a HUGE fan of yours and love your recipes. I recently decided to try out protein powder since you have it in many of your smoothies and smoothie bowl recipes. I had never tried any type of protein powder before. I bought the one that you recommend, the Sunwarrior Warrior brand in the unflavored flavor and used it in the Satiety Smoothie that is in your new cookbook. I don’t know if it is just me, but it tasted awful. I could barely drink it and almost decided to throw it out. I used 1 scoop like it said. Does it just take some getting used to? It tasted chalky and just had a nasty flavor. I was gagging drinking it. Do all protein powders taste like this? Am I just weird? Any tips or help would be great! Thanks! Hi Mikelle, Thanks so much for the kind words! It’s great to hear you enjoy my recipes. :) I’m sorry to hear you weren’t a fan of that particular protein powder, though. I find it can really be a matter of personal taste…protein powder isn’t always one size fits all. Unfortunately, it can take some experimenting before you find one that works for you and suits your taste buds! To use up your remaining Sunwarrior Warrior Blend, you could try adding just a little bit less powder to your smoothies so the taste is more easily hidden. Maybe start with a tablespoon until you get used to it? Additionally, some smoothies do a better job of hiding protein-powder taste than others. I’d recommend trying out the chocolate hemp smoothie from my second cookbook. We are huge fans of smoothie bowls. I am always curious what folks put in theirs. I would love to know the calorie count of “In the buff smoothie bowl”, may be i missed it but i do not see it displayed on the recipe. Hi there Mee, I don’t have that calculation on hand, but you can quickly find out the nutritional info for the recipe by plugging it into a free online tool like nutritiondata.com or caloriecount.com. Hope this helps! I am addicted to this smoothie! Thanks so much for the recipe. I have a 5 week old baby, and I look forward to this during our morning feeding. It is def helping me stay full all morning. I tried the natural Sun Warrior protein powder for the first time in this, and I’m a fan of that as well. Thank you! Congratulations on your new little one, Jen! I’m so happy this smoothie’s hitting the spot during those morning feedings. Wishing you all the best! Where do you buy the Sunwarrior protein powder? I live near Burlington, Ontario. Hi Amy, You can often find Sunwarrior protein powder in specialty or health food grocery stores. I personally buy it at Organic Garage as it’s cheaper than Whole Foods. 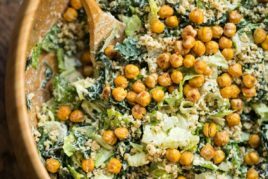 Do you have the nutrition information for this recipe? Hey Jessica, I’m sorry, I don’t have that info on hand! But to find out the nutritional breakdown fairly quickly, you can head over to a free online tool like nutritiondata.com and plug in the recipe’s information. It should calculate everything for you! I just bought your book & have tried a few recipes. All have been very, YUMMY! I have a question about your “Cashew Sour Cream” recipe. In the book it does not say how to store it & how long it will last? I have some leftover & I was wondering can I use it? Thanks so much for your support, Sabrina! As to storing the Cashew Sour Cream, you can keep it in an airtight container in the fridge for up to 1 week or in the freezer for 4 to 6 weeks. I love to freeze my leftover sour cream in a silicone mini muffin tray. That way I have convenient individual servings for thawing whenever! The pictures are looking very nice, love to taste this dish., Thanks for sharing. This looks great! I’m a vegan newbie and have a question…I am allergic to banana. Is there anything to use to substitute for banana that would give the same thickness and low in calorie? Hi there Andrea, For a banana sub, you might be able to get away with adding more pitted dates (to compensate for the lost sweetness) and a touch more avocado (to mimic the creaminess). If you experiment, please do let us know how it goes! I genuinely I wish I could eat this every day! Such great ingredients and the photographs are beyond stunning. Off to try this right now! That does look pretty awesome. I tend to always be in a rush in the mornings (mostly because I get up late!) Can it beade the night before? Do you find the Sunwarrior protein works well with breastfeeding? Hey Kate, I use both Sunwarrior Warrior Blend (in natural – stevia free) and Omega Nutrition Pumpkin Seed Protein Powder. I like them both because of their very short ingredient lists, and that they’re rice-free. I love that it is gluten free and i am going to try this recipe. It is already looking delicious. Also check my blog http://www.beegans.com/ for more vegan articles and recipes. This smoothie bowl is soooo good! I will be making this every week! I made this and it is soooo good! Thank you!!! Thanks Leah, so happy it was a hit! This was SO GOOD. I came across this as I was making one of your raw recipes. I was forwarded from another site. I make smoothies and I love smoothie bowls but never tried to make a smoothie bowl. I did substitute almond milk for unsweetened vanilla coconut milk and coconut peanut butter for almond butter since I had those. I also used my protein which is garden of life raw organic protein. It was delicious and very filling! Thanks for sharing. I have found Yuve Vegan Protein Shakes to be a great option to get your protein in. They are specially formulated for a women’s nutritional needs, but men can enjoy them too!